Prior to 1847 the State of Missouri made no provision for the education of blind citizens. In that year the legislature authorized $80 per year for the education of indigent blind youth, with a lifetime cap of $160 per person – enough for two years of schooling. In addition the total sum appropriated for blind education was $1,200 per year – which would educate a total of 15 blind pupils! In the early part of 1851 the Missouri legislature appointed a committee to inquire into the feasibility of including education of the blind at the institution for the “deaf and dumb,” which was established that year; meanwhile private citizens had taken the matter into their own hands. 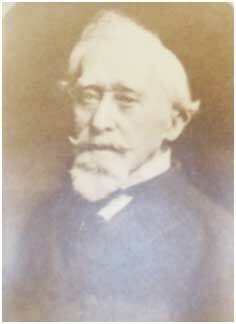 Mr. Eli William Whelan, a blind man who was the former superintendent of the Tennessee Institution for the Blind, had arrived in St. Louis in the fall of 1850 with letters of introduction to several prominent citizens, including Dr. Simon Pollak, an ophthalmologist (pictured below). Mr. Whelan and Dr. Pollak formed an association of 20 clergymen and philanthropists who planned to found a charitable institution and to apply for state support when they had established their credentials. This plan of action had been successful in 11 other states east of the Mississippi, beginning with the establishment of the New England Asylum for the Blind, founded in Boston in 1830. It was followed within ten years by schools in New York, Philadelphia, Ohio and Virginia, and during the 1840’s in Kentucky, Tennessee, Indiana, Illinois, Mississippi and Wisconsin. "There are only a few blind persons in Missouri, the United States census reports to the contrary notwithstanding. It would be time, labor and money lost to try to teach the blind to read or do anything else." 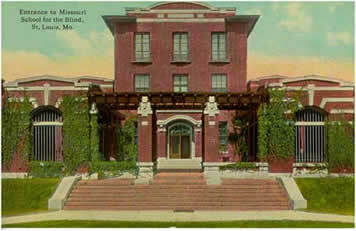 Fortunately, both Elizabeth and Daniel were talented both intellectually and musically and their accomplishments persuaded the legislature to authorize the founding of a school to be called “The Missouri Institution for the Education of the Blind.” The school’s inaugural date was February 27, 1851. In addition the state granted the school an appropriation of $3,000 per year for five years on condition that its founders first raise $10,000 privately. 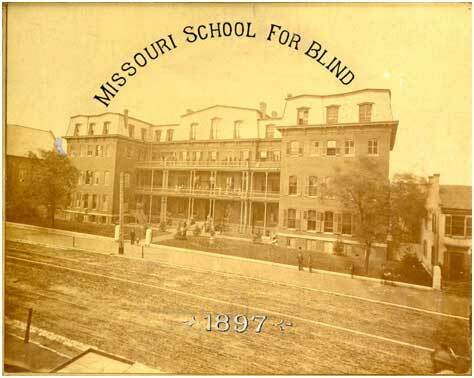 It took the founders several months and additional student exhibitions, but eventually they raised the $10,000 and the Missouri Institution for the Education of the Blind was formally opened on November 1, 1851. The school remained a privately-controlled endeavor for several years until its founders determined they could not continue to support it. In 1855 the school came under the control of the Missouri state legislature. Over the following 160 years of its existence Missouri School for the Blind has been under the supervision of various state departments, including the State Board of Guardians and the State Board of Charities and Corrections, and since 1921 it has been operated by the Missouri Department of Education. After several years of deliberation the Missouri Legislature agreed to sell the school property and buy or build a new facility. One-hundred-fifty-thousand dollars was appropriated to purchase up to three acres of land. They selected the current site of the school across the street from Tower Grove Park as the open space would offer students a place to exercise and it was in a quiet, safe residential neighborhood but only a block from public transportation. 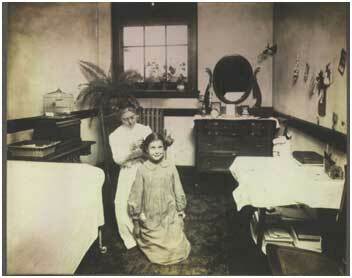 The school moved into its new red-brick quarters in September, 1906 (see photo below). The state’s appropriation was insufficient to complete the entire building as planned so it was quite overcrowded; each dorm held 18 students instead of the 12 they were built for and pianos and music practice were crammed into dormitories or classrooms. Eventually, in 1912, one of the two needed wings was added, but the second was not built until the late 1950’s.For the first 25 years of the school’s existence all teachers were required to live at the school. Beginning in 1879, this rule was changed and only the superintendent and matron (housekeeper/ supervisor) were required to live on campus, although other staff could do so if desired, which many did. The superintendent resided on campus until the late 1990’s. "Giving the pupils such care as a mother gives her children, being with them at such times as they are not in class, training them in manners and neatness of person, and giving them the detailed attention that pupils in a large institution usually fail to receive." Such attention from staffers was especially important as students stayed at the school for months at a time, going home only for summer vacation.